Baby farm animals are CUTE. But in my opinion, baby GOATS are the CUTEST. :) When Michelle said we could come up and see her 2 day old kids, I couldn't get there fast enough! I was so excited. 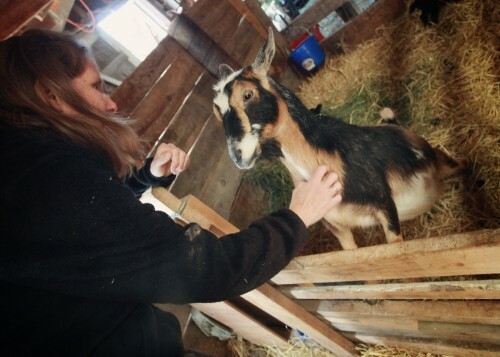 Especially knowing that we are probably going to be having some goat babies of our own in the next year. It made it that much sweeter! This one was my favorite...the coloring is so yummy! Of course, we had to stop over and see the other goaties and Oreo the Llama as well. Before we left, Michelle showed us the chicks that had just hatched that morning...there is always something new happening on the farm! **The other family photographed here is my awesome unschooling friend Lisha and her girls. They are moving from Colorado to northern Idaho tomorrow! If any of you are in Idaho or know like-minded mamas in that area...let me know!! This is my friend Michelle. 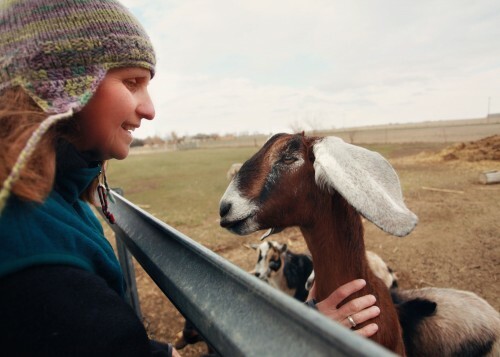 I like to call her the "Crazy Goat Lady"...but she is much more than that. She is a mentor, an encourager, a fellow unschooler. I am so thankful that she and her husband Tim have graciously allowed us to come hang out at their farm and learn. She is so patient with my newbie questions and happily shares her knowledge. All of my goat paparazzi photos have been of her goats...with a few that will soon be OUR goats! As we were leaving the farm recently, she brought out a large box of magazines. I'm somewhat of a magazine "enthusiast" so my heart started racing pretty fast at the mere sight of it. 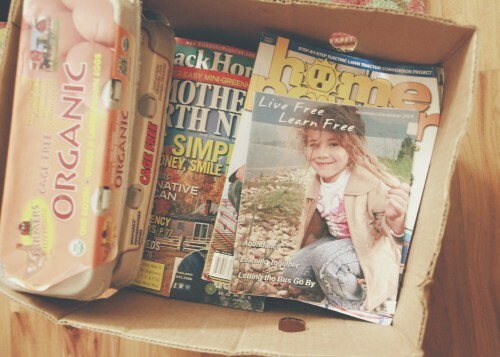 Back issues of Mother Earth News, BackHome, Backwoods Home, Home Power, Acres U.S.A., Hobby Farms, Live Free Learn Free (out of print)...pretty much a homesteader's dream box. So much information to be consumed! *said breathlessly as I throw them all in the air...commence slow motion movie with pages floating down all around me as I spin, backlit by the sunset*. And perched on the top of them...two dozen eggs from her hens for me to purchase. The happiness never ends! 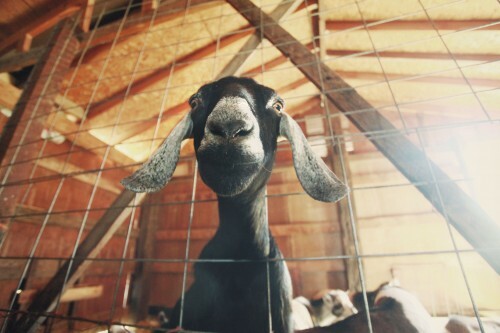 Apparently it's impossible for me to post a blog without a goat photo. I couldn't help it. She is just too cute. And now back to your regularly scheduled blogging: I'm a researcher. I LOVE the feeling of new information in my brain! :) It's been quite awhile since so MUCH new info was being introduced on a daily basis. It's gooooooood. I kind of feed bad for hoarding all the good chicken, gardening, homesteading, and goat books from the library. Kind of. But obviously not enough to return them yet. Sorry Longmont friends! Now that I've had a chance to peruse all of these books, I thought I would would compile my favorites in an aStore for you. When you click on these and purchase, I will receive a small part (as an affiliate payment)...and that helps me pay for keeping this blog active. I will keep adding to this list...if you notice that I am missing something amazing...let me know! 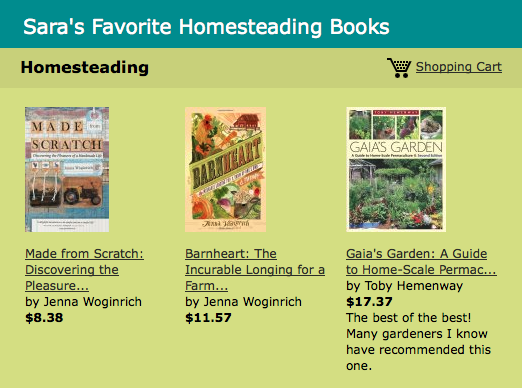 Please also share your favorite resources for learning about farming (urban or rural) and homesteading. Let the knowledge sharing begin!